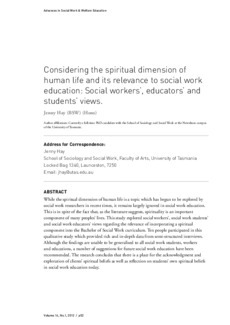 While the spiritual dimension of human life is a topic which has begun to be explored by social work researchers in recent times, it remains largely ignored in social work education. This is in spite of the fact that, as the literature suggests, spirituality is an important component of many peoples’ lives. This study explored social workers’, social work students’ and social work educators’ views regarding the relevance of incorporating a spiritual component into the Bachelor of Social Work curriculum. Ten people participated in this qualitative study which provided rich and in-depth data from semi-structured interviews. Although the findings are unable to be generalised to all social work students, workers and educations, a number of suggestions for future social work education have been recommended. The research concludes that there is a place for the acknowledgment and exploration of clients’ spiritual beliefs as well as reflection on students’ own spiritual beliefs in social work education today.